The culture of South Africa is as multi-faceted as the diamonds for which the country is known. In fact South Africa is so highly multicultural that it's difficult to offer the traveller a hard and fast set of etiquette rules to follow. There is no doubt that family is important to the local residents of South Africa. For some groups, the nuclear family is primary. For others, the extended family receives more priority than the immediate family. And for others, the tribe is the fundamental expression of community. You should always bear this in mind when traveling in South Africa. South Africa is filled with contrasts. This is perhaps most evident in the differences between urban and rural customs and conventions. Rural dwellers tend to hold a narrower view of the world, due in part to their Calvinist heritage. Rural residents hold to traditional views and place high value on their families. South Africans in urban areas place greater emphasis on materialism and success, especially those residing in Johannesburg. Even among urban areas differences exist. 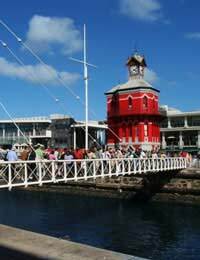 Local residents of Cape Town place a great deal of emphasis on social standing and family ties. Generally, South Africa is known for its relatively informal atmosphere. In most situations, dress can be a little more casual and behavior a little less formal. However, this shouldn't be considered a license to discard all boundaries of behaviour! Regardless of where your travels take you, proper tourist etiquette and cultural sensitivity demand that you err on the side of conservatism. There's always time to loosen up a little later when you've learned your way around the culture. In contrast to the general informality, there are specific etiquette rules for South African golf courses. South Africa is a popular golfing destination. If you are heading south for a week at the links, pack shirts with sleeves and collars. And don't plan on playing in jeans--they're not allowed on South African golf courses. By the way, how many golfers do you normally see at a halfway house? Golf courses in South Africa have a "halfway house" where you stop for a drink and a sandwich after nine holes. Even if you don't fancy a break, skipping the halfway house will annoy the other golfers. A general rule that's good to follow in any country is to avoid the use of gestures. If you think that the hand gesture is rude in your own country, the chances are that it is probably rude in South Africa. For instance, talking to someone in South Africa with your hands planted in your pockets is considered impolite. Also, try not to stand too close or point your fingers at someone when you're talking. A final word of advice: think before you speak. If you are wondering whether you should say something or not, you probably shouldn't. This is especially true for humour. Phrases and observations that you may think are funny may be perceived otherwise on the streets in South Africa. Spend some time listening to the way local residents construct their sentences. After just a short time of active listening, you should be able to increase your chances of being understood. Even though you may consider yourself to be on holiday when you travel, you shouldn't think of yourself as freed from the social rules that you normally follow. Fully experiencing a different culture may require that you be a little more observant of those around you and a little more reserved in your behaviour. South Africans love to BBQ, we call it a Braai. If you are invited to a braai, be sure to bring your own meat, drinks and something that can be shared by all those attending. When eating at a restaurant be sure to tip the waiter at least 10% of the bill.